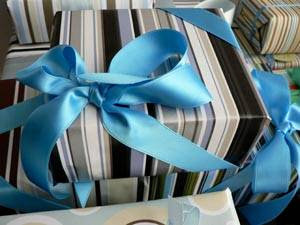 I love to wrap my Christmas presents in "fun" paper and beautiful ribbons. Side note: I use quotes around "fun" because according to my Mom only cream, silver, gold and maroon are allowed on or under the Christmas tree and anything other than those are a no-no. Well, as soon as I moved in with the BF and had my own tree, those rules went right out the window and I got all kinds of pretty patterned paper to wrap my gifts in. You should have seen my moms face when all my "fun" packages arrived at my parents house to put under the tree for Christmas morning... priceless! Anyway, I searched and searched and finally found the cheapest place for satin ribbon...Papermart (my secret source). They seems to have the best prices around and have many different colors and widths available. I guess Cottage Christmas (from Cottage Living) agrees because I saw Papermart listed in there as their secret source too! 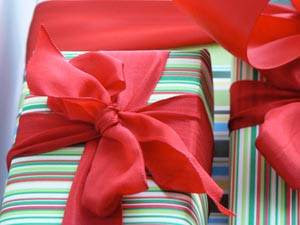 They also have great boxes, wrapping paper and other items needed to make your packaging beau-ti-ful! I'm posting this now so y'all have time to go and order some fabulous satin ribbon to adorn all those amazing Christmas presents you are giving this year. Beautiful. I can't wait to check out what they have. My mother in law is also very traditional in her wrapping. I was asked to pick Christmas ribbon for her a couple of week ago and I happened to pick out a brown ribbon. Whoops huge mistake with her. That went right back to the store. 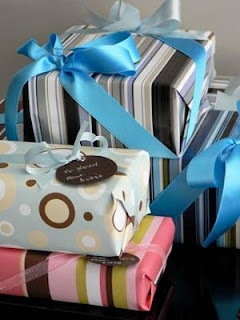 So happy that we now can have our own traditions and wrap gifts as we see fit. I've been looking for this, thanks for the tip! It is after all - all about the presentation! I always love a really wonderfully wrapped present! Have you see "style court" blog, she always has the most amazing wraps. These are Gorgeous! The wrapping paper and ribbons are so fun!